They have 38 games against two of baseball's superpowers, the Red Sox and the Yankees, and the Rays could win 90-plus games as well. As the Orioles begin the process of rebuilding, they've done almost nothing to upgrade the lineup -- what's the point, after all -- so why would they be 13 wins better than the 47-win team of 2018? A lock. There are always over-under win-total bets worth making. The Cubs and Rays over. The Giants and Blue Jays under. None is as sure a thing as the under on Baltimore at 59.5 wins. The Orioles are in a brutal division. They're in active rebuild mode, so any valuable assets will be dealt. They might not be 47-115 bad again, but they won't be much better. They took some serious hits to last year's 82-win team, but they should get credible starts from all five spots of the rotation. It's hard to be that bad with an above-average rotation: FanGraphs' projections have them at 79 wins, and Baseball Prospectus' forecast is for 81, assuming there isn't more midseason tearing down to come. The Astros won their division each of the past two years, and they are basically guaranteed to do so again. The Mariners and the Rangers are rebuilding, the A's can't possibly repeat what they did last year and the Angels don't possess nearly as much talent. The Astros are crazy good. Six months have passed and I'm still not sure how the A's won 97 games. They'll be good again, but not that good. And certainly not as good as Houston. Think the 2015 Royals or the 2016 Cubs. Milwaukee has unfinished business, like those teams had the previous seasons. And this isn't even a World Series prediction -- just that the Brewers won't drop more than nine games off their 96-win total of last year. The Reds are going to be able to hit, but I'm not sure they have any chance at slowing down their opponents, which is a major issue in a loaded National League Central. I think they will struggle in that division in a big way this season, and if they are even close to repeating a league-worst 10-29 mark in one-run games, this under is a lock. The Reds were a bottom-half team in scoring runs and a bottom-third squad in preventing them last season. But the additions ofSonny Gray, Tanner Roark and Alex Woodshould bring their pitching closer to the middle of the pack, while the offense should be improved with the acquisitions ofYasiel Puig and Matt Kemp as well as the expectation of a bounce-back year from Joey Votto, a full, healthy year from Jesse Winkerand the promotion of prospect Nick Senzel. I would call the Reds one of the most improved teams of the offseason, and I think this is a .500 squad. At best, it will sneak its way into the playoffs. It's not a big payout, but it's hard to see a path for anyone to topple the Indians in the AL Central race. Some have gotten excited about the Twins. Don't listen to those folks. Cleveland has a huge talent-plus-experience buffer against everyone else in that division, and it has a roster that should get better as the season progresses as the Indians fill some of the holes that they didn't fill this winter. Puig hit 23 home runs last season at Dodger Stadium in limited plate appearances (444). 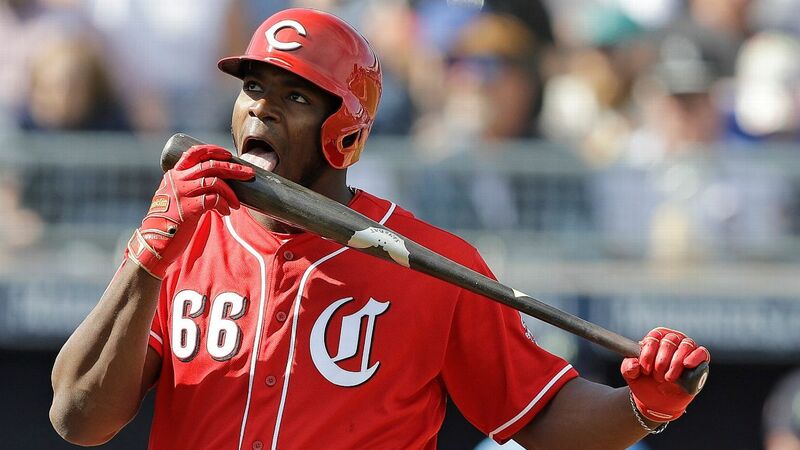 The year prior, in 570 plate appearances, Puig hit 28 long balls. Now Puig gets to hit in Great American Ball Park for half of his games and is projected to get roughly 600 plate appearances. He's already hit four home runs in 32 at-bats in spring training. I think we are ultimately just fading a serious injury, so I grabbed the over. The Phillies added more thanBryce Harper. The offense is remade, David Robertsonsettles the bullpen, the defense has improved and several of the young starting pitchers are about to blossom. This is a 90-win club bound to play games in October. Yes, predicting the NL East may feel like a fool's errand, and the Nationals have a history of disappointing seasons (including last year). But they're my pick to win the division, and I think they do it with 90-something wins. They lost Bryce Harper, but they'll have a full season of Juan Soto plus Victor Robles to make up for the loss. Most importantly, they've fixed the big holes: catcher (Wilson Ramos and Kurt Suzuki), rotation depth (Patrick Corbin, Anibal Sanchez) and bullpen (Trevor Rosenthal, Kyle Barraclough). The Rockies' Blackmon is listed as 40-1 in the NL MVP race, behind 20 other possible contenders. Last season, Blackmon's bWAR (0.8) was torpedoed by ugly defensive metrics and an uncharacteristic dip in BABIP. His move to an outfield corner could make Blackmon look like the league's most improved player in his age-32 season, because he is minus-48 DRS for his career in center but plus-5 on the corners. That and replication of his 2017 offensive season -- which is but a BABIP regression away -- could propel Blackmon into the running. Reyes is a large man with big power, and he simply needs an opportunity to launch myriad home runs.Hunter Renfroehas the same odds, and it's likely only one of them plays regularly; but Reyes hit a homer every 16 at-bats as a rookie, and no ballpark tames him. There is a chance for 40 big league blasts. Want a long shot that really could pay? Soto at 30-1 for NL MVP isn't bad. Want a dark horse that could pay really well? Look at exit velocity, marry it with launch angle and you get Royals first baseman O'Hearn at 200-1 to be the home run champion. One other home run crown long shot: Rays outfielderTommy Pham(500-1), who had a top-10 exit velo last season. MVP voters are getting a lot smarter, and they'll love it when Soto posts a .300/.450/.580 line with 100 runs and 100-something RBIs. He's also made it an emphasis this spring to improve his defense (which will help his WAR, which will help his MVP case). Mike Trout and Alex Rodriguez were MVP runners-up in their age-20 seasons; Soto goes one spot higher. I have to wonder: Did the oddsmakers watch Acuna last year? Did they see the damage he did -- 56 extra-base hits in 11 games? The OPS of 1.028 in the second half? The willingness early in his career to take a walk? At 25-to-1, that's a great value bet. Does 60-1 count as a long shot? If so, then I'm all-in on Acuna Matater. Last April, a scout told me this about Acuna's bombs: "As high and far as I've ever seen anybody hit 'em." In the second half last season, when things started clicking for Acuna, he hit 19 homers in 68 games. Over a full season, that pace works out to 45 bombs, which is league-leader territory. A super-young lineup that underperformed last year plus an old rotation of veterans whose careers were derailed by injuries means the Rangers are probably terrible. But one could imagine (if not count on) them getting 140 starts from the rotation and 85 bombs fromJoey Gallo and Nomar Mazara. If it all works, maybe they will win 84 games, and maybe that's enough in a league that has a massive drop-off after the top four teams. It's a contract year for Puig, which means he'll be motivated. He is one of a few stars on a bad team, which means he'll play every day. He is hitting at Great American Ball Park, which means he'll get his fair share of home runs. We might see something close to the Puig of 2013. There is some health risk here, and the division is certainly improved, but Corbin's advanced metrics were even more impressive than his stellar 2018 numbers suggest, and I believe all Nationals prop bets hold some value given that the public is overreacting a bit to the impact of Harper's departure. This is something of a safe long shot, but Stanton hit .266 and 38 home runs in his "down" year as a Yankee in New York. Just one year prior, Stanton hit 59 in Marlins Park (ranked 29th of 30 in park runs factor; Yankee Stadium ranks sixth). My projections have him hitting 5.4 home runs more than any other batter, and Stanton has ranked top-eight in average exit velocity each season since Statcast started tracking it in 2015. Give me +600 he leads the majors again. Every year, there's a favorite to win top rookie honors, and every year, something seems to go awry with that race. I know, I know,Victor Robles.But these are great odds for a pitcher who has an unusually low-risk skill set, including a 92-93 mph fastball and very good changeup, as well as pinpoint control of each. Paddack's spring work has been electric. He is looking more likely to be in the Opening Day rotation than not. And let's not forget that while Petco Park is no longer the pitchers' heaven it once was, it is still a rather favorable environment for a pitcher to call home.